Good news, Dear Readers! 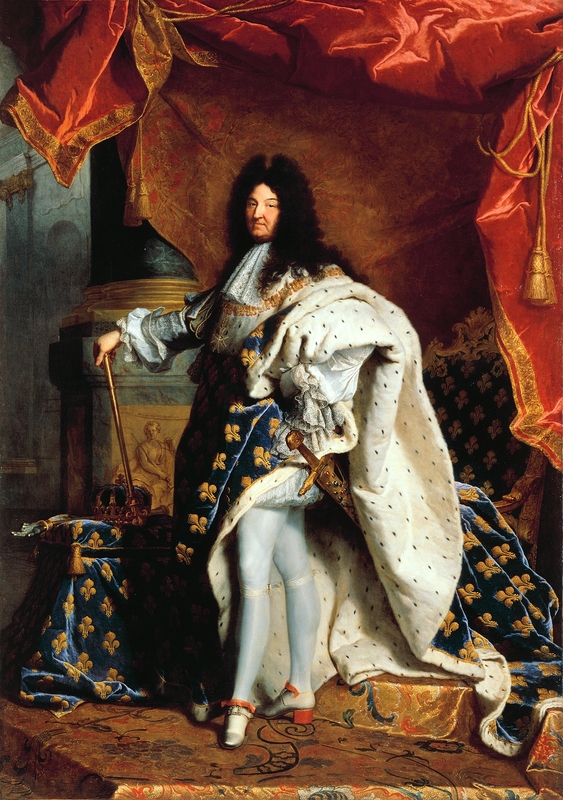 The Drawing Lady, everybody’s favorite tortured art teacher, is going to teach us how to draw a portrait of Louie XIV of France! But please remember that The Drawing Lady has only recently recovered from the last lesson she gave us — when we made her so frustrated with all our questions and bad drawings — that she felt compelled to jump from the sixth story art school window — breaking every bone in her body. She’s since recovered but– . . . oh here she comes now . . . remember best behavior everyone . 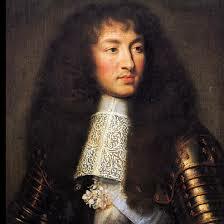 . .
Today The Drawing Lady will be teaching us how to draw a portrait of Louie XIV of France. 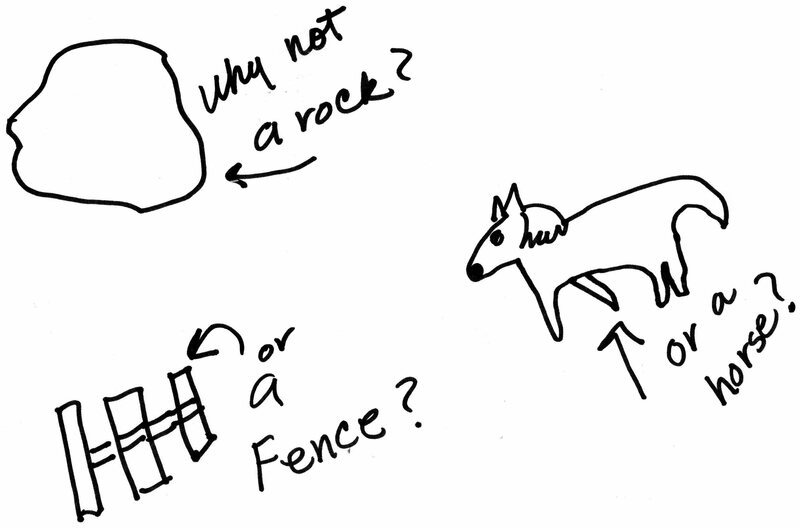 Perhaps, Dear Readers, you are asking yourselves why Louie the XIV of France and not a rock or a fence or a horse? Dear Readers! What did we just talk about? 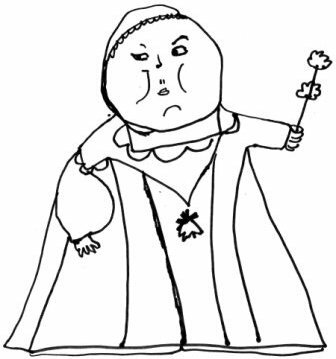 You are upsetting the Drawing Lady already with all your questions! 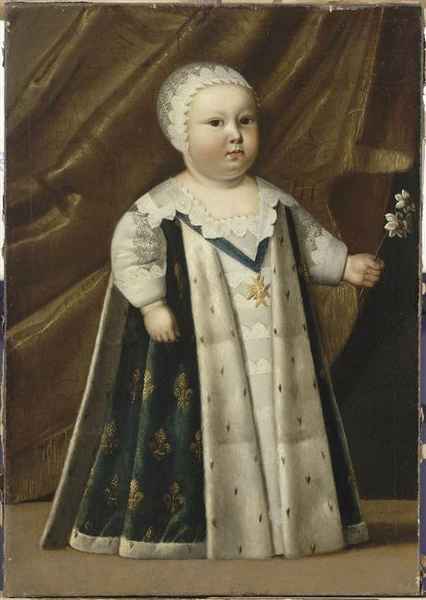 The Drawing Lady would simply like you to draw this portrait of Louie XIV of France to the best of your ability. Like this, Drawing Lady? Is this good, Drawing Lady? 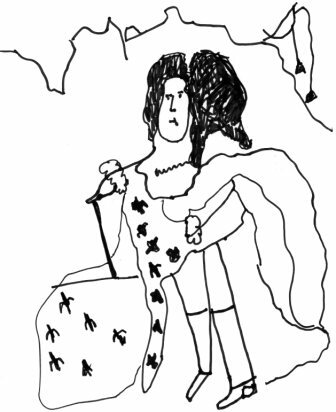 Does this look like Louie XIV of France, Drawing Lady? Did we get the expression in the eyes right, Drawing Lady? 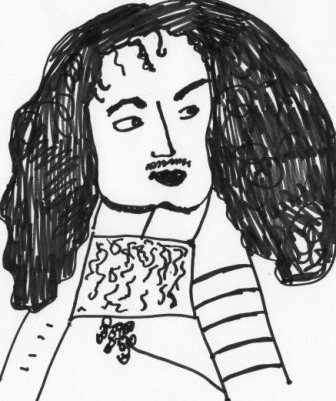 Dear Readers, The Drawing Lady is acknowledging that you have attempted to draw Louie XIV, but that is all. She has begun hyperventilating ever so slightly and implores you to try harder, much much harder. Like this, Drawing Lady? Is this good, Drawing Lady? Did we produce a distinctive aesthetic experience for you, Drawing Lady? Do you like the way we drew his legs, Drawing Lady? Dear Readers! The Drawing Lady has taken a break from her hyperventilating to swear a blue streak! She cannot believe how poorly you have drawn the example! The Drawing Lady absolutely insists that you put more umph into it this time or she’ll . . . well let’s not think about what she’ll do. 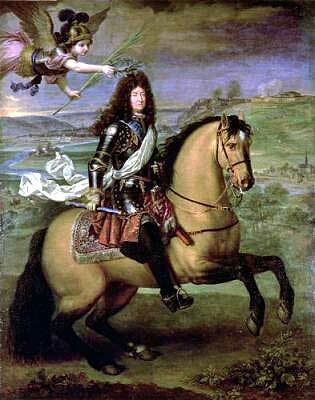 The Drawing Lady would like you to try your very best to draw this portrait of Louie XIV in battle. How’s this Drawing Lady? 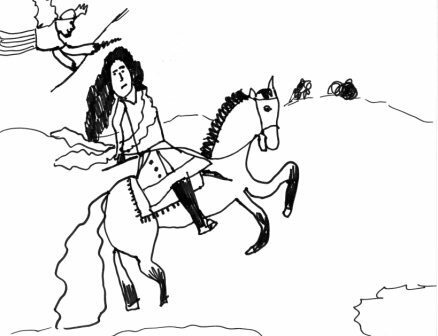 Did we get the horse’s feet right, Drawing Lady? Do you think we were able to capture his generosity of spirit, Drawing Lady? How this Drawing Lady? Do you think the flower is impassioned, Drawing Lady? Why are you opening the window, Drawing Lady? . . . Drawing Lady? . . . Drawing Lady? . 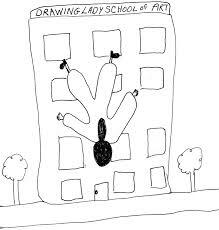 . .
Dear Readers, I regret to inform you that the Drawing Lady has exited the building via her usual way —by plunging from The Drawing Lady School of Art’s sixth story window. This conclude our drawing lesson for today. Reluctantly I might add WordPress allowed me access to your blog today – as ver it was worth it. Fine post. Thanks Mike! I’m glad your back to normal. Or at least WordPress is. You are far from normal. In a good way! Oh I’m so glad you’re back in business, Mike. Hopefully WordPress is done throwing its little tantrum! Oh I really love that idea! That’s exactly what is going to happen to her next time!! Thanks for the suggestion! And I do have a new look. I think it’s going to take a while to get used to. I can’t wait to see how it goes! Ha ha me too! I want to put a banner on, but it’s so nice outside, I don’t know if I’ll be able to discipline myself to get it done! If it’s nice, I’d want to be outside too!! You say “tortured” art teacher like there’s any other kind. Have you ever met the professor of a writing program at a university? Thorough torment. This was really funny. A lot of people have the nerve to label their blog as ‘humor’ but you can deliver the goods. I never have met a writing program professor but I can imagine the level of torture. I knew a journalism professor that was downright bitter though. (and had absolutely NO sense of humor) And thank you for your kind words, Mark! Much appreciated. You’d think the school would have installed a slide or an landing airbag or something for her by now. Who knows, then she might even enjoy it and be able to get back to her happy place! You know that’s a darned good idea. I’m going to have to have that arranged. Maybe she could just wear a dress that turns into an airbag on impact! Because I have a feeling she jumps out of windows wherever she goes! comments to the Drawing Lady. But it was worth all the napkins. Lol! BTW, I used to blog at Tales of Wild Boomba, but can now be found at http://lesliejochase.com/ I hope you’ll drop by! I will do that right now! Thank you! I love your new professional site. I couldn’t find anywhere to leave a comment so I’ll leave it here. That banner is really spectacular! And I loved your few quotes. I’ve signed up for notices in my e-mail and am looking forward to reading more of your stuff. Thanks! I’m so glad you like the new look and that you subscribed! Yay! There’s a place to leave comments somewhere….I just can’t think of where that would be right now! Sharon Rosenzweig, “Investigative Cartoonist,” and co-creator of the book The Comic Torah with her husband, comedian Aaron Freeman, said,”don’t get a portrait taken! You’re practically a cartoon anyway!” She’s amazing and and she and Aaron are our very close friends. You’ll never meet nicer people. I’ve taken off most of the stories to compile in a book. So that’s really a coincidence that your friends have written a comic version of the Torah! How about that? I think that’s really cool! I bet they would, too! Thanks! I think you can comment at the vend of each blog itself. It looks like Louis xIV is being abducted by aliens in the second to last picture…maybe that is what REALLY happened to him! Ahah! It does. Well at least it looks like something! It’s so hard to draw material! Especially royal material! And maybe that’s what happened to Louie XiV! He probably got abducted 14 times! These drawings are fine to me. They were produced by marks on a surface just like the painted versions. 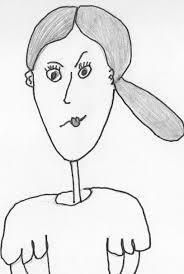 The drawing lady – is she all right now, after her frustration?